This edition’s selected passages from Tacitus’ historical and minor works give a sample of a Latin author acknowledged as one of the most difficult—and also the most rewarding. 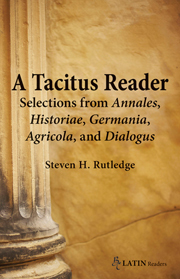 Rutledge presents a Tacitus he unapologetically terms “the greatest of the Roman historians” in reading selections that highlight major subjects and themes: the corruption of power, confrontation with barbarians, and narratives of historically significant episodes, many marked by the era’s signature violence, promiscuity, and murderous death. Tacitus’ stylistic brilliance likewise finds its due here: his powerful language, vivid character portrayal, use of speeches, and the authority he claims for himself as historian. The commentary addresses problems Tacitean syntax and grammar may pose for readers new to the author, and helps to situate Tacitus among other Roman historians.